Actually it turns out there is a God, and He's German, and He happens to read this blog, and He's fat. This morning I was wondering, as one does, how to occupy the valuable half hour immediately after breakfast and went and pondered John's current solar drier experiments and realised that with the summer sun more directly overhead modifications are required to capture the strong rays and dry out his thinly-sliced pieces of apple. 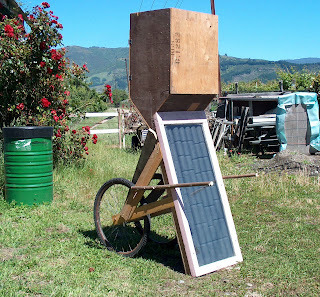 We built a solar drier as our contribution to saving the world. It is not a particularly big contribution, but this region has more hours of sunshine than anywhere else in New Zealand and we have to make up somehow for our excess consumption of sunblock. - There's no ozone at all here. Well, four or five molecules, not many more. Neglecting eye protection just this once, as one sometimes does, I cut some blocks of wood and buzzed them on the sander prior to gluing. God was very kind and didn't lash a twelve-inch adjustable spanner to the second block, but in retribution for yesterday's post, He did allow it to shoot up and whack me in the face. Eyeball, specifically. I reared back in shock and immediately danced round the shed. I really did. I hopped about as if trying to backpedal time and since I was hopping at the speed of light this wasn't entirely unfeasible. If there'd been an audience they would have passed round a cap and put coins in it. In fact if I'd known in advance what was about to happen I would have strapped bells to my shins and turned it into a Morris dance. Anyway it bled inside itself, a haemsomethingorother, and got several doctors all alarmed and now I have to waste the day going to see an ophthalmologist in Nelson. I felt the best thing would be to ride over there but all the doctors demurred, saying an eyeball jiggled on top of a bicycle isn't what you want if it's full of blood. Which is a pity, because I always feel energy-consumption guilt driving (in this case, being driven) to Nelson. It costs us ten litres of diesel oil getting to Nelson, which doesn't sound like much until you figure out that it's ten litres of high-grade energy and then you recall from your physics lessons that the energy concerned is the same amount of energy you'd have to use if the engine broke down and you were to have to get out and push it to Nelson. All of which puts transport into true context and makes bicycling rather sensible, because pushing a bicycle to Nelson is conceivable whereas pushing a car isn't. What I didn't know till the other day was that New Zealand is an oil producer. On the 19th November (one makes a note of these things) I was amazed to learn from Gerry Brownlee, the New Zealand government minister in charge of energy, that oil is New Zealand's third biggest export commodity. Our consumption of oil is 183,000 barrels a day, which means that 22 of us, combined, use up a barrel of oil daily. This is quite an interesting figure because it too takes oil consumption out of the abstract. You can imagine 22 people - about five households - having a barrel of oil delivered to their doorsteps each morning like the milkman used to do. (Well okay, milk, and pints, but you get the drift.) And using it all up. And expecting another barrel tomorrow. It's a collective thing, not just the business of what we put in our cars, so when you enter New World, our local supermarket, you shiver even in the heat of early summer because just inside the electrically operated sliding doors are huge fridges with no front whatever to them so all the cooled air cascades into the shopping area. I don't suppose this electricity comes from oil, but it certainly comes from somewhere and one does have to ponder the fact that our ancestors managed without electric sliding doors and chilled beer, and it looks like our descendants might just have to too. And do we really need wide-screen plasma TVs? They use five times as much electricity as or'nery ones, I read. Gerry Brownlee is pretty fat too, come to think of it. He's a sort of human planet. Maybe having a fat energy minister is a good plan because when Peak Oil finally arrives, we can boil him down to two or three hundred kilograms of useful lard. Somewhere here you might just be able to see Gerry Brownlee among the crowd. And Peak Oil's likely to come to New Zealand sooner rather than later because Gerry Brownlee has decided to open up all the oilfields and gas fields that can be found off the New Zealand coast to commercial exploration. After all, why bother preserving a scarce resource? - Anyway I'd better discontinue this line of discussion. Comparing Gerry Brownlee with God could easily get me imaginatively punished again, and by a raft of disparate opinion.